Election Special 4. The ex-Presidents, The Bel Ombre skull and the 25th November Defence Forces Day. Tomorrow the country celebrates the Defence Forces Day. We the people salutes our boys and girls in Uniform on this occasion and wish to convey the pride with which we the people look up to them. 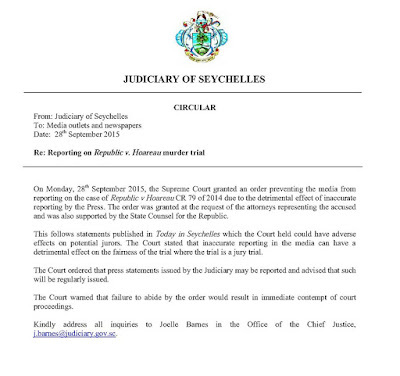 We the people would take this occasion to remind our boys and girls in uniform of the oath they would have taken when swearing in: -- to uphold and defend the constitution of the Seychelles, its people and nation. The people would also remind our guys in uniform that they are one of us; that they share, and are part of, a non-violent, friendly, peaceful, docile population that enjoys happy living. The other fight -All NEW presidential hopefuls have another very important fight before the election day. Remember the infamous rhyme ‘’En vote pou Ralph Volcere and a vote for Philip Boulle is a vote pou James Michel’’? Wavel will be playing that unsubstantiated tune again, and at an opportune moment that does not allow the president hopefuls targeted to respond in any way. All candidates would be smart to come out and warn the nation of Wavel’s coming battle cry, how unintelligent and inaccurate this statement is, but to expect it from Wavel. 2015 Presidential Elections special. 2. What lies ahead? There may be honour amongst thieves, but is there honour amongst politicians? James out. Michel in. – won by the system, not at the polling booths? ROS. --- POU ANVOYE, PA POU ANVOYE? James Michel warned earlier this year, ‘’People in glass houses do not throw stones’’. This was meant solely for the break-away cluster of ex- SPPF/PL ministers and technicians who surfaced as the new political party, ‘Lalyans Seselwa’. There were massive expectations from the public that we were in for a spectacular fireworks show, in that for once we would know the inner (maybe even dirty) secrets of the SPUP/SPPF/PL era. Thus far, people have been disappointed. Campaigning has started earnestly, elections will come and go, but no stones will be thrown. Those concerned would be good boys and pay heed to Michel’s warning. 2015 Presidential Elections -1-The Players. Peaceful, Free and Fair? Peaceful, Free but NOT Fair. – Which will it be? And who benefits from either? Yet another Election Day fast approaches, a day that most believe could well be the most important day in our republic's history. Others are not so optimistic. The players: What started with eight political parties and a declared independent candidate in the run-up, the hype and political temperature, and especially expectations naturally on the high. Will there be a new beginning? Will there be any new players at this last minute? At least players that could make a difference? Ahmed Afif Of Lalyans Seselwa Fights Back! I note the response of this day by State House rebutting the validity of information we have received concerning some planned ambushes against key members of Lalyans Seselwa. The statement further urges me to substantiate these allegations. Members of Lalyans Seselwa has just learned from reliable sources that state security agents, the army, NDEA and some select Tazar personnel have been assigned the task of planting illegal substances or weapons at the residential premises of key members of Lalyans Seselwa with the objective of ambushing them at the appropriate moment, charging them for illegal possession and keeping them under detention indefinitely. According to their information, this operation is masterminded by State House. One of the key objectives it appears is to prevent Ton Pat and Lalyans Seselwa from successfully lodging their nomination for the Presidential and Vice Presidential candidates on Nov 11th 2015. "We will bring this to the attention of the Electoral Commission immediately and alert the public so they know better if indeed this rogue regime reverts to these cowardly tactics at this late hour". 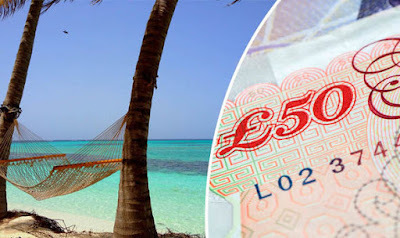 Nations such as Belize, Marshall Islands, Seychelles and Vanautu - which are all included on a European Commission 'blacklist' of international tax havens - have all received cash handouts from the UK Government. Under a controversial new law introduced by the Prime Minister, Britain is legally obliged to spend 0.7 per cent of Gross Domestic Product (GDP) on foreign aid spending. However, critics of the foreign aid commitment reacted with fury after it was revealed millions are being handed over to countries that set minimal or even zero tax rates. An investigation by the Independent found that, for example, more than £1.8million of UK cash was given to the paradise Caribbean island of Anguilla in 2013. This is despite the nation - which has an estimated population of less than 15,000 - charging no income, capital gains or any other form of direct taxes on residents or companies, with it described as a "zero-tax jurisdiction". Opposition parties in the island paradise of the Seychelles have cried foul after the lead challenger to the president in coming elections was arrested over what they say are trumped up charges of molesting a Sri Lankan “houseboy”. 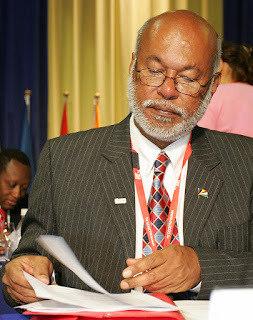 Patrick Pillay, a former High Commissioner to Britain who welcomed the Duke and Duchess of Cambridge to the islands for their honeymoon four years ago, was questioned by police last week and is now waiting to hear whether the Attorney General will charge him. A former minister, in April he announced the birth of a breakaway party from the Parti Lepep, the all-powerful ruling group which has in various incarnations run the country for 36 years. He is accused of bringing a 30-year-old Sri Lankan, Gihan Fernando, to the principal island of Mahe against his will, forcing him to work as a virtual slave between December last year and February this year, and making sexual advances towards him. The South African Revenue Service (Sars) on Thursday said its officials had seized crystal meth worth more than R16-million at OR Tambo International Airport this week. Sars issued a statement following Wednesday’s seizure of a bag containing 20.6kg of the drug that “had come to South Africa from Abu Dhabi via the Seychelles”. The discovery came after customs officials “stopped two baggage handlers for questioning and decided to search an unaccompanied bag that they had in their possession”. “The officers became suspicious after detecting a strong smell of glue and sent the bag for a scan‚” Sars said. 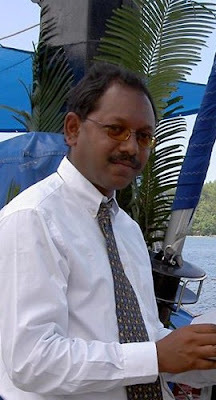 (Lanka-e-News -24.Aug.2015, 11.30) The Financial crimes investigation department (FCID) that is conducting investigations based on a complaint had unearthed a wealth of information regarding the colossal sums of money earned fraudulently via robbery of public funds by the Rajapakse family which have been remitted to Seychelles Island and are with the Seychelles State . It is also revealed that the Bank of Ceylon branch which was opened in Seychelles some time ago has been used as a center for their money laundering activities. Who Are The Pirates Somalis Or Seychellois? Robbers target at least three yachts in the Seychelles On 11 August, the counter-piracy Combined Task Force (CTF) 151 conducted a joint operation in the Somali Basin aimed at strengthening international cooperation in preventing piracy and illegal trade in the region. The exercise involved both military and non-military authorities from Pakistan, South Korea, Spain, USA and Japan, who took part in the operation that also extended to the Gulf of Aden and the Gulf of Oman. The operations indicate that, although levels of piracy have reduced in the region since the peak of activity in 2012, the threat remains of real concern on an international level. Drink and heroin killed sailor in Seychelles - but was alcohol spiked?